Available for Kindle (£6.02 but not US yet) and in the iTunes Store (£8.99). Punctuation – in English at least – is one of a handful of subjects most likely to result in brawls and shouting matches. Although even in this book it does not appear to have caused a riot or armed conflict, NEWS Thump’s spoof story is perhaps not so far from the truth. If it isn’t apostrophes, it is commas, or dashes: for such tiny marks on paper, English punctuation is disproportionately contentious. Ironically it was this same publisher who, in 2003, unleashed Lynne Truss’s book Eats, Shoots & Leaves: The Zero Tolerance Approach to Punctuation on an apparently receptive public, to become a best-seller. There is additional poetic injustice in that amazon.co.uk and amazon.com have both managed to mis-spell this book’s title in different ways, the former using “Pernickity”, the latter “Persnickety”, though I concede that the latter may be a translation into North American English. A sequel to his Spell It Out: the singular story of English spelling, Making a Point starts with a riveting account of the history of English punctuation from the days of unspaced text (scriptura continua) inscriptions, through sometimes faltering attempts in Old English manuscripts, early printers and their assumption of the task of punctuating their books, and the resistable rise of grammarians. Crystal’s words are liberally interspersed with quotations, examples, and a few clear figures. As one of the greatest living authorities on the English language, Professor Crystal’s account is full of wise insights. Being a real linguist, unlike most who have felt the need to instruct us how to punctuate, he rounds against prescriptivism. But the history which he traces so readably is such forceful demonstration of the false premises that give rise to many punctuation rules. Early in the book, he identifies the conflicting purposes of punctuation which have given rise to its near-religious controversies: how some punctuate for phonology, to help the reader speak (or hear in their mind) the words, and others punctuate for semantics and grammar. 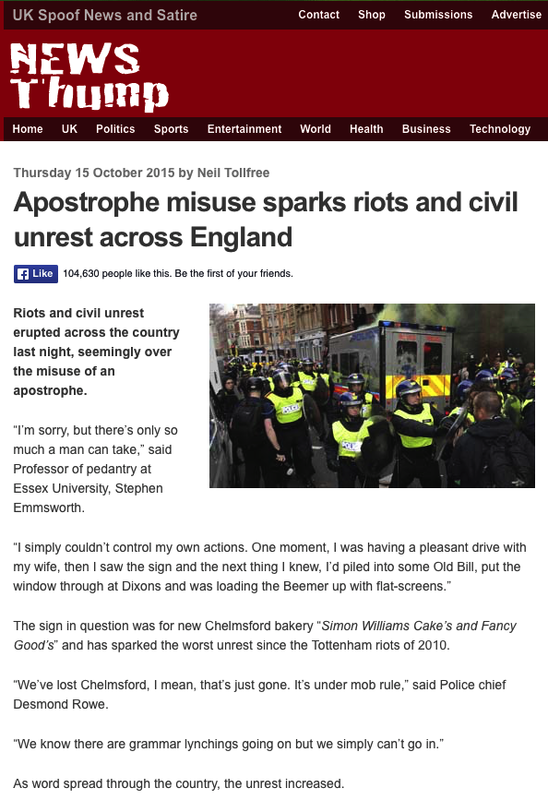 As English phonology and grammar only partially overlap in their demands, there will inevitably be conflicts, and riots over apostrophes. After the first hundred or so pages, Crystal changes tack to consider the structure of the punctuation system, and the importance of white space. He then develops individual accounts of each of the elements within English punctuation, from the paragraph and its styles, through the period – he tells us that Ben Jonson referred to it appropriately as a prick – dashes and ellipsis dots, exclamation and question marks, semicolons and colons, commas, hyphens, apostrophes, round brackets, and quotation marks. He concludes with brief considerations of styles such as italics, and some of the many issues about punctuating text on the Internet. End-matter includes an excellent appendix on teaching punctuation; although this is centred on teaching children, its points also apply to teaching English as an additional language. There is a valuable list of recommendations for further reading, and a single index which is comprehensive in scope. Crystal’s overall message is that punctuation is a matter for pragmatics, and for pragmatism, not ideology and irrevocable rules. His account is informing, entertaining, and above all enlightening. You will learn of camel case such as ThisIsCamelCaseExemplified, and that the British long used the word period for what we now often refer to as a full stop. You will gain insights into the punctuating skills and styles of James Joyce, Jane Austen, and many others, and never be ashamed of using an ‘Oxford’ comma. I strongly recommend that anyone with an interest in the English language should buy and read this book. It is particularly important for advanced learners, and those who want to improve their English regardless of their first language. Posted in General, Language, Life and tagged English, history, language, prescriptivism, punctuation. Bookmark the permalink.